Mysia. Pergamon (circa 166-67 BC). 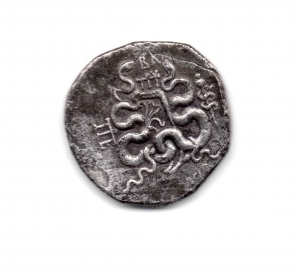 Struck 123-104 BC. AR Cistophorus (25 mm. - 11,95 gr.). D.\: Cista Mystica from which snake coils, around, ivy wreath with fruits. R.\: Two snakes coiled around a bow case, between the snake heads, monogram of ME, to left, monogram of ΠΕΡΓ, to right, staff of Asklepios. 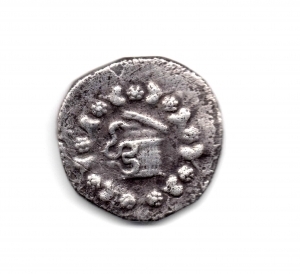 Kleiner, Hoard 18. BB. NC.